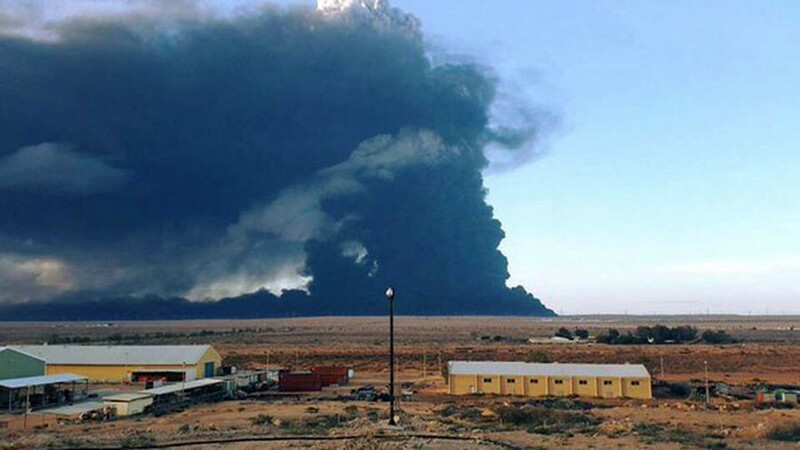 Militants affiliated with Islamic State reportedly attacked oil installations and set fire to several crude storage tanks near the port of Ras Lanuf, Libya. Photos posted on social media show huge plumes of black smoke rising from the ground. The tanks torched on Thursday morning belong to the Harouge Oil Operations company, Reuters reported, citing local industry sources. The militants also targeted a pipeline leading from the Amal oilfield to Es Sider. A video posted online by one of the fighters threatened further attacks on Libyan ports. "Today Es Sider port and Ras Lanuf and tomorrow the port of Brega and after the ports of Tobruk, Es Serir, Jallo, and al-Kufra," said Islamic State (IS, formerly ISIS) fighter Abu Abdelrahman al-Liby, as cited by the news agency. Breaking: Major attack by #ISIS/Daesh at Sidra, just west of burning tanks at Ras Lanuf. This area comprises #Libya's largest oil terminal. #Libya: The pipeline leads from Amal Field to the oil storage tanks at Ras Lanuf. The explosion took place at a point near Ras Lanuf. The previous attack happened last week when an explosion hit an oil pipeline south of the port town. Ras Lanuf is one of Libya’s biggest oil terminals and also has a large refinery. Militants loyal to Islamic State have staged several attacks on pipelines and other oil sites in the area over the past few weeks. Last week Libya’s National Oil Corporation, which operates the Ras Lanuf terminal, said it had emptied storage tanks at the port as a precaution against further attacks. Islamic State (IS, formerly ISIS/ISIL) is gaining ground in Libya, which remains in a state of chaos after the toppling of its leader Muammar Gaddafi in a NATO-backed uprising of 2011. The group has taken responsibility for, or is suspected of being behind, several attacks apparently aimed at seizing control of oil infrastructure.